Enterprise resource planning (ERP) is an all-in-one business process management software that allows an enterprise to manage its business including clients, employees, suppliers, projects, manufacturing, warehousing and shipping. Some ERP's also include a ledger for accounting, a human resource module and a bill of materials (BOM). Many small, medium and even large companies have not yet invested in an ERP because of the high price and the learning curve due to the complexity of outdated legacy systems but today with the advances in technology, programming and online UX it is possible to create light custom solutions that are cutting the price and the learning time. The main advantage of an ERP is to eliminate human errors due to data manipulation between applications using excel spreadsheets. Also having an ERP allows for a better communication and work flow between the team, customers and vendors all working in real time on the same platform. 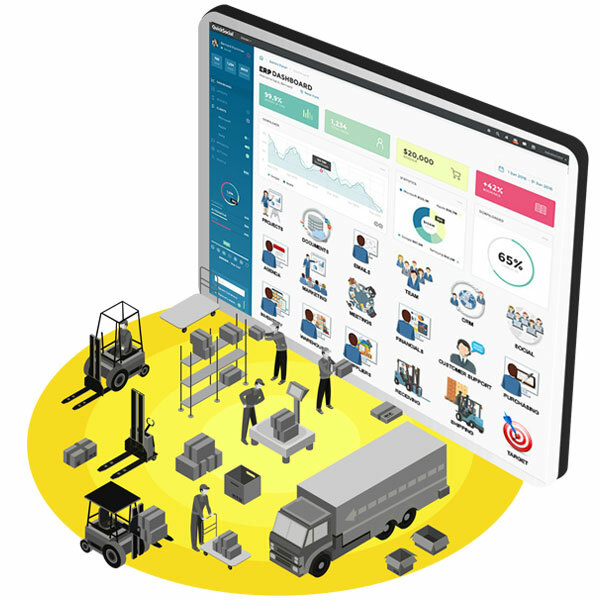 An ERP also helps the manufacturing process using a bill of materials to buy the right amount of parts not to have overstock of some and not enough of others delaying the manufacturing of your products. At the end of the day an ERP will give you better control and visibility of your enterprise reducing redundant tasks and save you money eliminating most human errors by standardizing critical business procedures and lowering purchasing costs. THE QUICKSOCIAL APPROACH TO ERP CUSTOM SOLUTION. Because some of us have worked and built ERP solutions since the mid 90’s we have found that there is not one software that fits all industries needs so our solutions are built custom, although we use the DNN CMS platform as a base and some exiting modules for general business process management but all the industry specific features are built custom allowing for a shorter learning curve and a lighter cost. PRICE COMPARISON OF ERP SOLUTIONS INCLUDING THE ABOVE FEATURES. Quick Social custom ERP 20 users + = $17,500 (one-time installation & training, no monthly or annual recuring fees for software subscription) –Optional* (hosting / security / maintenance / backups / technical support per year $6,000 payable per month $500). SAP business one subscription only (adds-on and hardware needed) 20 users = $22,560 (each year after) – $22,560. To have all features below, Training and support be prepared to invest an extra $50k. SAGE 500 with manufacturing 20 users = (year1) $82,500 (each year after) – $82,500 | training, maintenance and support not included (40 hours for installation). NetSuite ERP 20 users = (year 1) $35,000 (each year after) – $35,000 | training, hosting, security, maintenance and support not included.